B-boys and B-girls, welcome to the first European T.B.B. 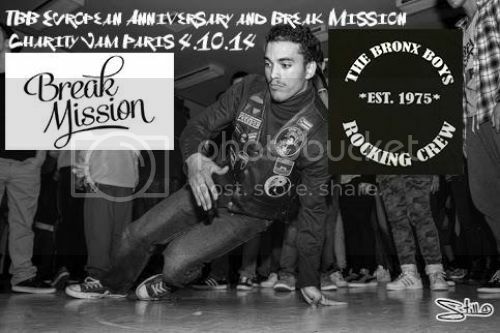 Anniversary, celebrating 39 years since The Bronx Boys Rocking Crew’s formation in 1975. Since 2010 we have held the anniversary in the Boogie Down Bronx but this year we’ll be holding an event in Paris too, running simultaneously with the one in the Bronx! This event is not just for T.B.B. members but anyone that supports this culture we are involved with. There will be jamming, cyphers, graffiti, talks on the culture, workshops and more!!!!!! Entry is FREE but all we ask in return is clothes and canned food for donation to a homeless charity. The place to be is Gymnase Curial 84, rue curial 75019 Paris. We welcome everyone to come party and enjoy what we call Hip-Hop Culture, Peace!!!!!! P.S. You’ll have myself (Skamrok) and my brother JOHNNY DETT laying down nothing but the heaviest sure shots all day long, plus my mellow JAM FU rocking the wheels at the after party!! !